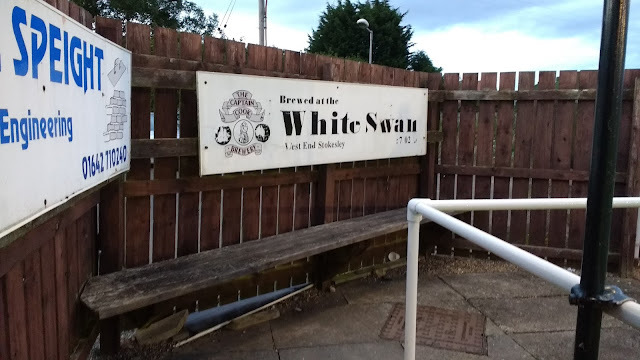 The club was formed in 1920 and spent the first 74 years of their history playing in local leagues, prior to joining the Teeside League in 1994. 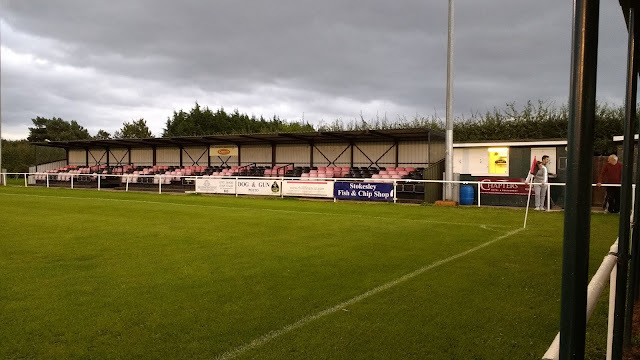 After 5 years here, they made the step up to the Wearside League, joining its second tier in 1999 and finishing as runners up to Redcar Town in their first season. 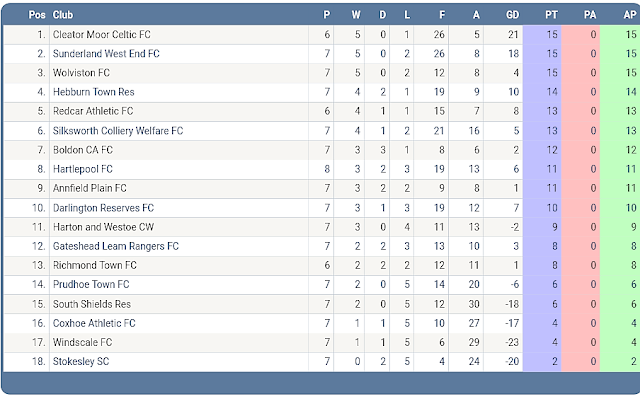 The league became a single division the season after and the good results continued with the club never finishing outside of the top half of the table. 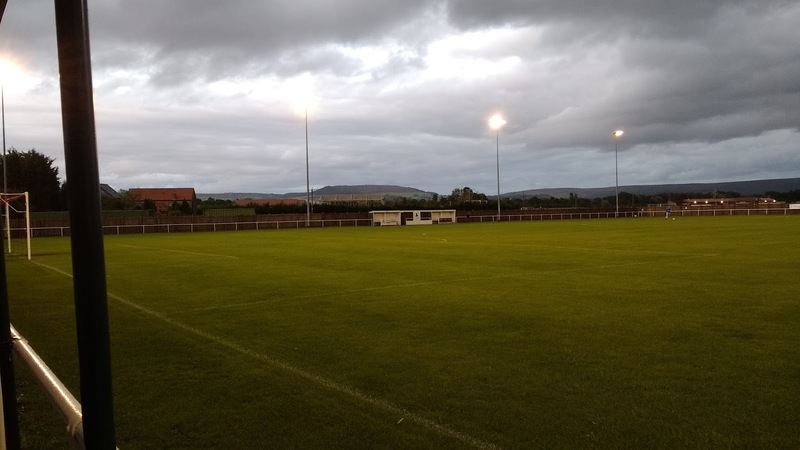 In 2006, Stokesley finished as runners-up to Whitehaven Amateurs, earning promotion to the Northern League in the process. Starting in its second tier, they had three mid table finishes, prior to winning the league in 2010. They spent two seasons in the Northern Division 1, with their best ever finish in the clubs history coming in their first season. 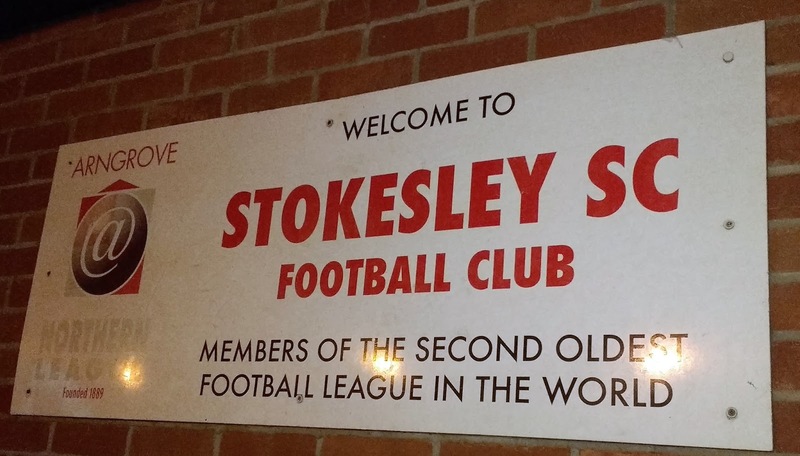 They were known as Stokesley FC during this two year period, but following a mass exodus, they reverted to their former name. This signaled a period of decline and the following season they were winless, gaining just 4 points all season. 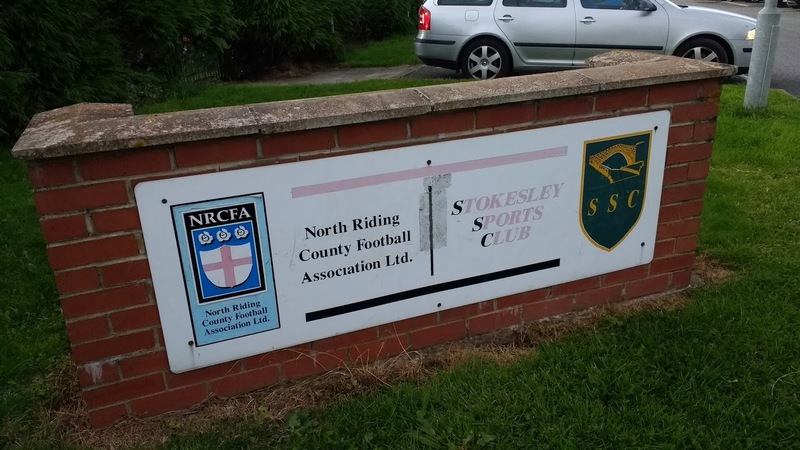 After a series of lower half finishes in Northern Division 2, Stokesley suffered a further relegation in 2016 and are now back in the Wearside League. After a 14th place finish last season, they have started the current season in poor form and currently sit bottom of the league without a win. Back in their Northern League days, Stokesley Sports Club spent a number of seasons in the FA Cup. There was not much progress though, with their best efforts being Preliminary Round defeats to Wakefield in 2009 and Spennymoor Town in 2010. They've also entered the FA Vase every season since 2007 with the best run coming in 2008. That season they beat Whickham, Chester-Le-Street Town and Bedlington Terriers before losing out to Spennymoor Town in the 2nd Round. 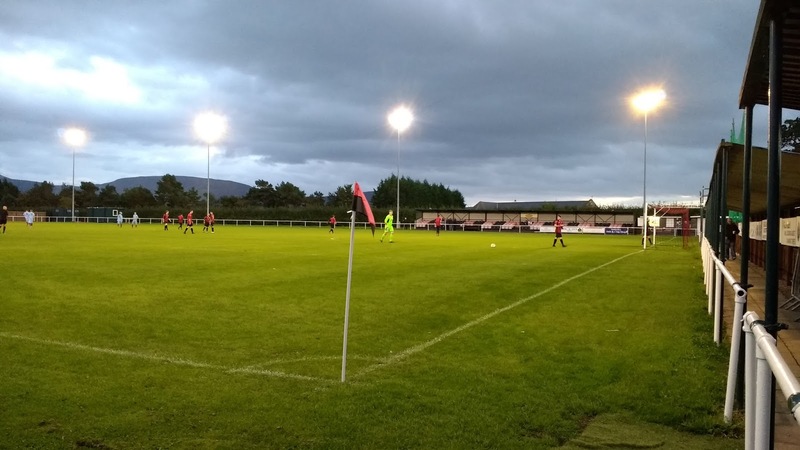 They also matched that a couple of seasons later, losing to local rivals Guisborough Town. Many local cups have been won, including the Jefferson Cup on 14 occasions. The final of the North Riding Senior Cup was also reached in 2009 where they lost to local giants Middlesbrough. As I was staying up near Liversedge, I was wanting to see a game on Wednesday too. Originally I was hoping for a double, although it was a little too early on in the season for the youth and reserve leagues to start. I'd at least see a game in the evening though and I initially had 28 options to choose from. I ruled out as many as possible. saving the most Southern ones for later and ruling out the furthest and least interesting. I got down to 4 choices - Stokesley Sports Club, Willington, Bishop Auckland and Heaton Stannington - all 4 strong contenders. I tagged all 4 clubs in a tweet and waited for responses. None came during my trip to see England play, so I decided to go with my heart. Stokesley had been incredibly friendly when the I'd had a late call off at Darlington in March. In the end, I went to Shildon and felt a bit guilty after Stokesley had been so friendly. So I vowed to visit in the future, I even played as them on Football Manager, completing the Wearside League double. I then won promotion from the second division of the Northern League. The following season saw a leveling out in the Northern D1, and playing the game realistically, I accepted a job at Conference North side Chorley, partly due to ambition, but mainly due to the fact that there were plenty of decent pubs in the town. On the day of the game, I woke up just before 7 am.After having a refreshing shower and getting dressed, I went down for breakfast. I always enjoy a nice fry up and this one was a decent one, coming with my favourite black pudding. I still had a few hours to kill before I had to check out at 11 am so I used it to advantage, listening to the radio and catching up on my blog, as well as planning the day ahead. I stopped at the farm shop that was part of my accommodation and bought some South African cider called Hunters Dry before leaving at 11.20. I'd chosen to go and have a look around Bradford as I had plenty of time to kill and there wasn't much on my route to tonight's game. On the way, I stopped at a Cash Converters on a retail park, hoping to buy a PSP and a digital camera, but there was nothing I fancied. I got into Bradford around midday, spending an hour and a bit at the Media Museum which was very good and free. In between an unsuccessful look around the shops, I went for a curry at a place called The Kashmir. 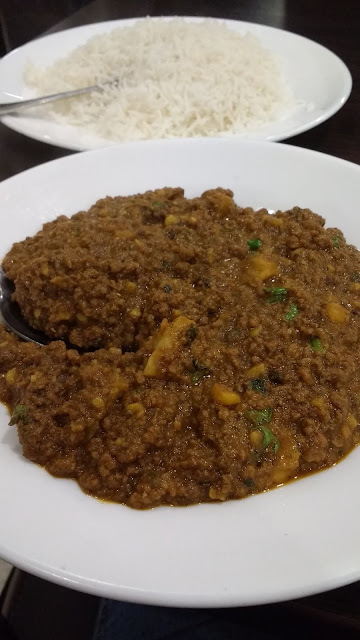 It was great value for money, just £5.30 for a Keema Dhansak and rice. The food was good and portions generous. 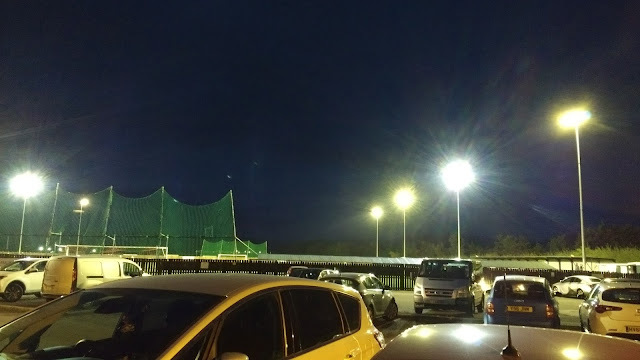 I got back to the car at 3.30, still with lots of time to kill. I drove to Shipley to see if they had anything worth buying in their cash converters, but again I drew a blank, so it looks as if I'll be stuck with my phone camera for the foreseeable future. Even worse, I accidentally drove down a poorly signed bus lane and will probably get a fine. Not a great experience for a first time visitor. By the time I got back to my car it was 4.40 and so I set the sat nav for Stokesley. 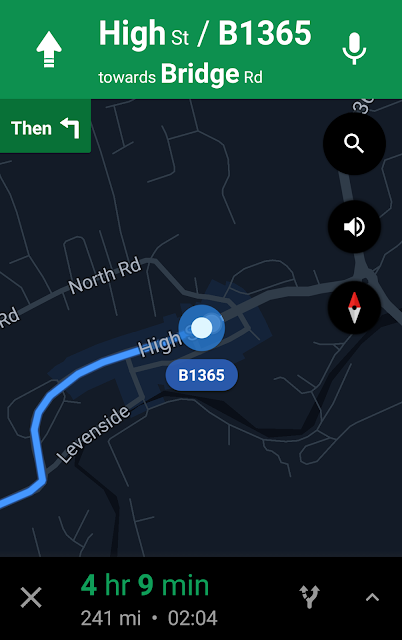 I wish I hadn't bothered going to Shipley to be honest, especially as it was a bit of a tip and a rare poor experience of Yorkshire. I got to Stokesley Sports Club at 6.20 and was glad to see the gateman in attendance. I picked up a free team sheet as well as buying a scarf for the bargain price of £2.50. 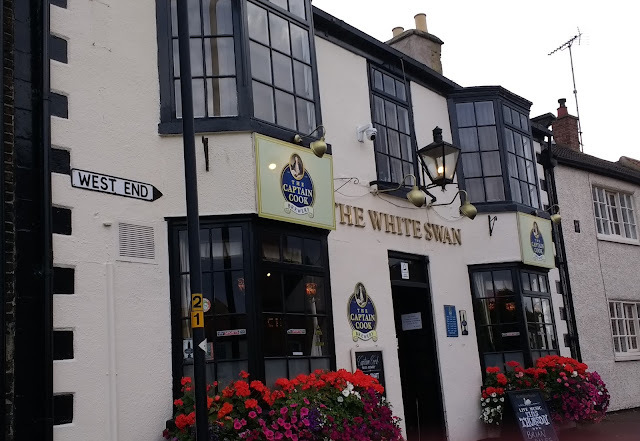 I jogged into town, more accurately, The White Swan Pub which was just over half a mile away. It was well worth it as I tried a new cider, Apple Jack Bristol Portway which cheered me up after a mixed day. On the way, I picked up a menu from a local Chinese takeaway, but not hungry yet, I didn't bother ordering anything. I got back to the ground at 7.20, paying £3 to get in and getting a warm welcome. 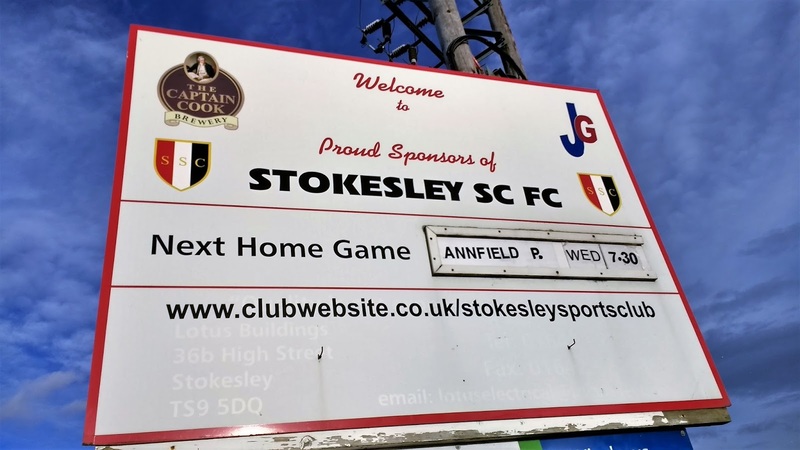 Stokesley came into the game on poor form, winless and bottom of the league with their only points coming from away draws at Gateshead Leam Rangers and Hebburn Town Reserves. 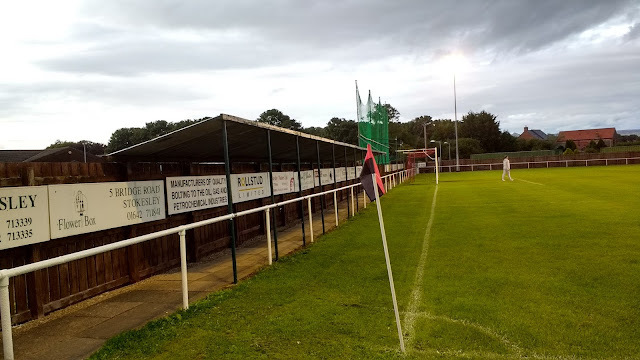 They also came into the game on the back of 5 straight defeats - including two to Hartlepool, who had defeated them 7-1 in the league and also knocked them out of the TWR Shipowners Cup by the far more respectable score of 3-2. 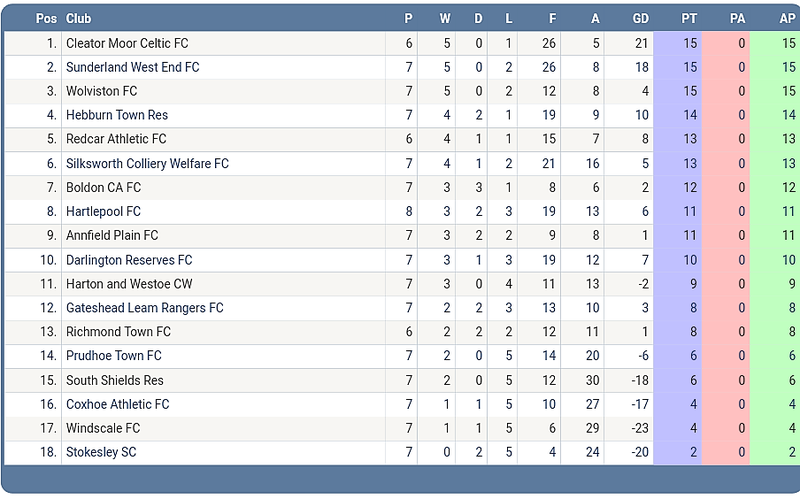 Annfield Plain came into the game sitting just inside the top half of the table, but fresh off the back of a 6-0 TWR Shipowners Charity Cup defeat to Hebburn Town Reserves. 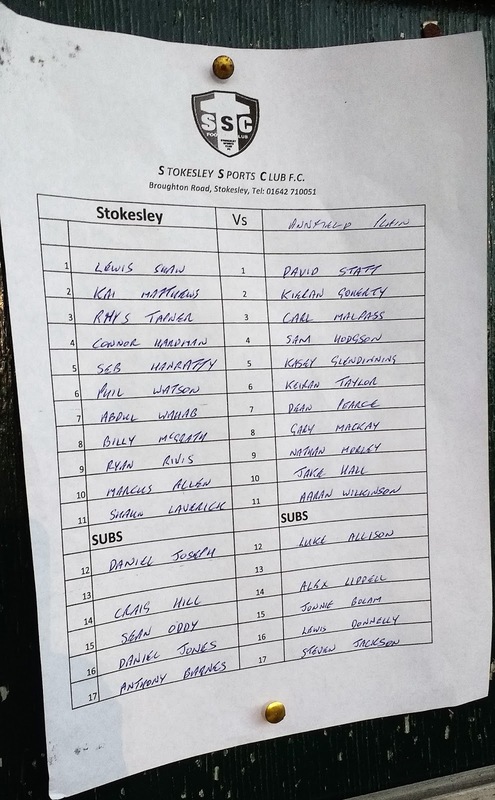 Looking at the original team sheet, it looked as if both teams had recent signings - Kai Matthews and Abdul Wahab for Stokesley Sports Club, whilst Annfield Plain had a new goalkeeper in David Staff as well as Kieran Taylor not listed initially. The game started pretty evenly, Annfield Plain perhaps the slightly more confident, but Stokesley started to grow in confidence after vocal encouragement from their manager. 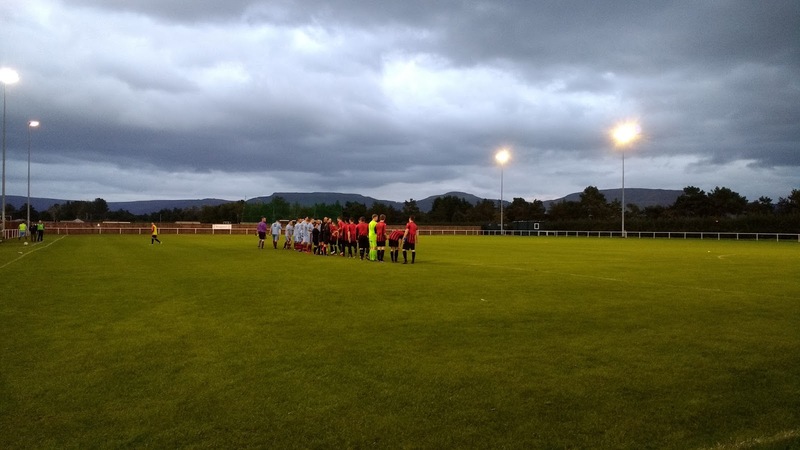 The hosts took the lead on 13 minutes when a good through ball split the visitor's defence and Ryan Rivis took advantage, finishing from around the penalty spot. Just before the half hour Stokesley thought they had doubled their lead, but it was ruled out for offside. The hosts were dominant by now, but even so Annfield Plain had a good spell just before half time. It was getting a bit cooler by now and being the only spectator in the ground with short sleeves at that point, I went out and got my jacket out of the car and also bought a Bovril. Stokesley started the second half well and they doubled their lead on 47 minutes, this time it was Phil Watson's curling shot that went in off the bottom of the right-hand post. They missed the opportunity to make it three when they hit the bar but didn't have to wait long to extend their lead. On 49 minutes Marcus Allen slid the ball across the box and Rivis was there to score his second, this time firing into the top left-hand corner from close range. Visiting keeper David Staff made a smart save to tip the ball over the bar to prevent the fourth going in. 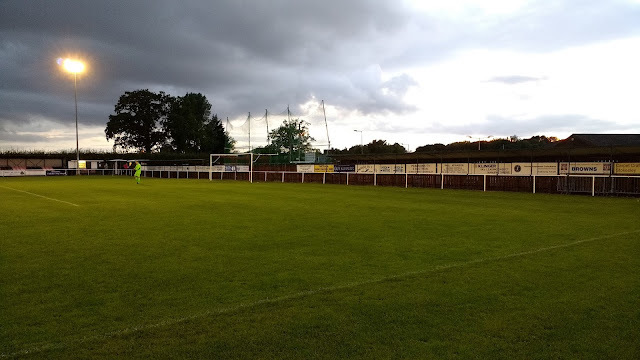 By now Annfield Plaiun were restricted to chances on the break, the closest they came to scoring was with a headed flashed past the post and a dipping shot from distance which went just over. In between these two chances, Stokesley did get their fourth. Billy McGrath crossed and Abdul Wahab tapped the ball over the line. 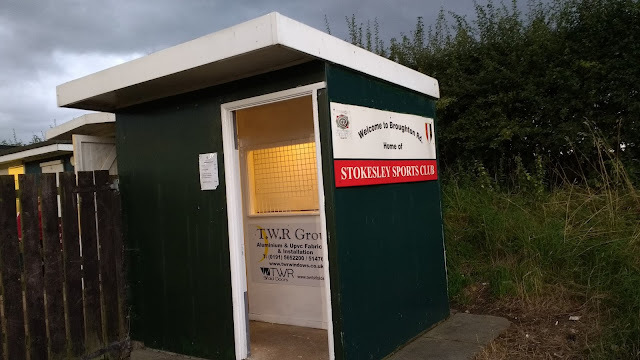 Despite further chances for both, the scoreline stayed the same and I was pleased for Stokesley Sports Club who now moved above Windscale at the bottom of the league. They'd been great hosts, with a few people thanking me for coming as I left. 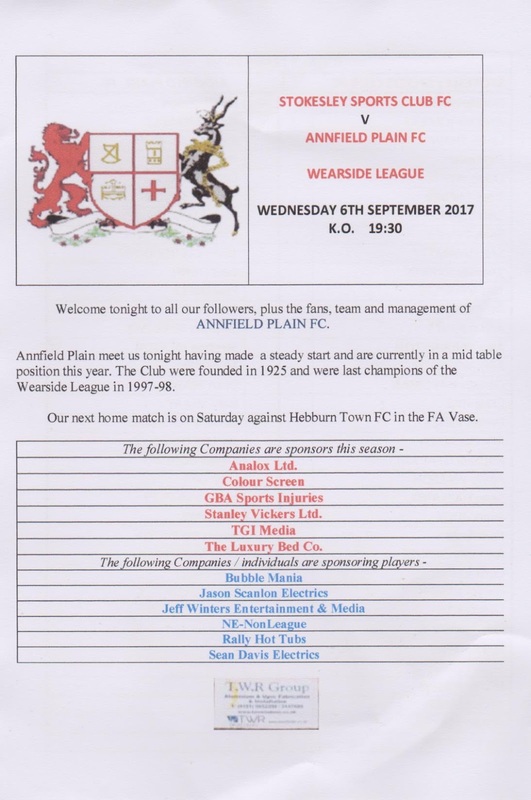 Their next game is at home to Hebburn Town in the FA Vase on Saturday, They will have home advantage, but with their opponents sitting in 4th place a level above, it will be a tough game for them, but hopefully, they can pull off a shock. I'd also been impressed with the standard of the Wearside League and will certainly look towards visiting some more grounds in this league. For me, my next game is Anderlecht in Belgium on Friday, but first I had a long trip home. Before I left though, I got myself something to eat, having salt and pepper chips from the local 'China Wok' Takeaway. They were decent, whilst not being exceptional. I left Stokesley just before 10, with my estimated time of arrival back home being just after 2 am. There were lots of roadworks on the way home, but happily, nothing that affected my journey time too badly. Listening to some podcasts on the way back, I got in at 1.50 am but was in no mood for bed. I stayed up for an hour or so, having a couple of cans and watching some TV. STOKESELEY SPORTS GROUND has served at a higher level and so is a lot better than most at this level. 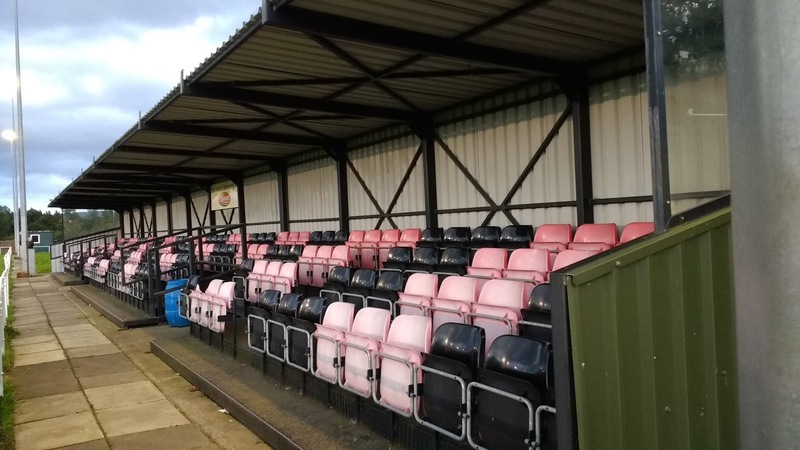 There is the typical metal 'Arena' type stand - this does at least have black and red seats, laid out in stripes and has a capacity of 100. The rest is standing, with the overall capacity of the ground being 2000. There is substantial cover behind one goal, with a few hundred being able to keep dry under this if it rains. Unlike most at this level, there is a club shop with scarves and badges definitely available, plus possibly hats and wristbands. The scarves are an especially good deal at £2.50 each. 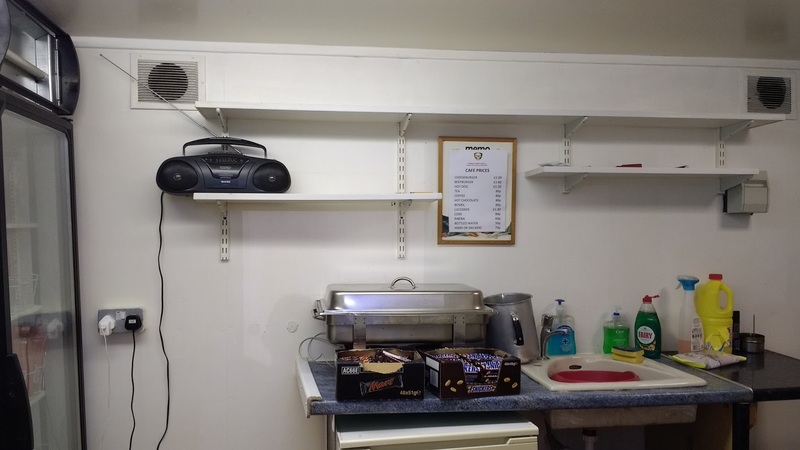 There's a reasonable tea bar with hot drinks, plus burgers and hot dogs. 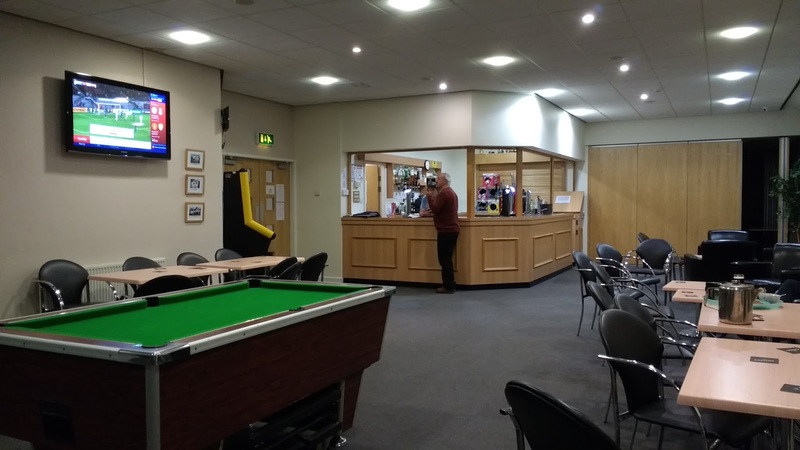 The bar is outside the ground and has Sky Sports and a typical range of drinks you'd expect from a clubhouse. Further afield, the small but pleasant town centre is around a 10-15 minute walk away and has a reasonable range of pubs and food places. I personally enjoyed the White Swan best, but there's something to suit every taste.